Medium sized, spineless deciduous shrub with lobed leaves. 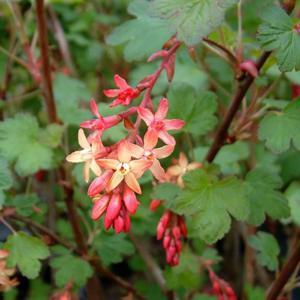 Produces unusual and attractive flowers that are bronzy red on the outside and yellow within, borne in drooping racemes in spring. Does not set fruit. Any reasonable well drained soil, in sun or part shade. Very hardy. Prune after flowering to tidy. Hybrid of R.odoratum x R.sanguineum, found in Ipswich, UK, in 1837.